Modern marketing is complex. Many enterprises struggle to integrate disparate marketing technologies, to get insight from proliferating data, and to reach customers in a coherent way across diverse channels. If this sounds like your organisation, at some point you’ll benefit from working with MarketOne. 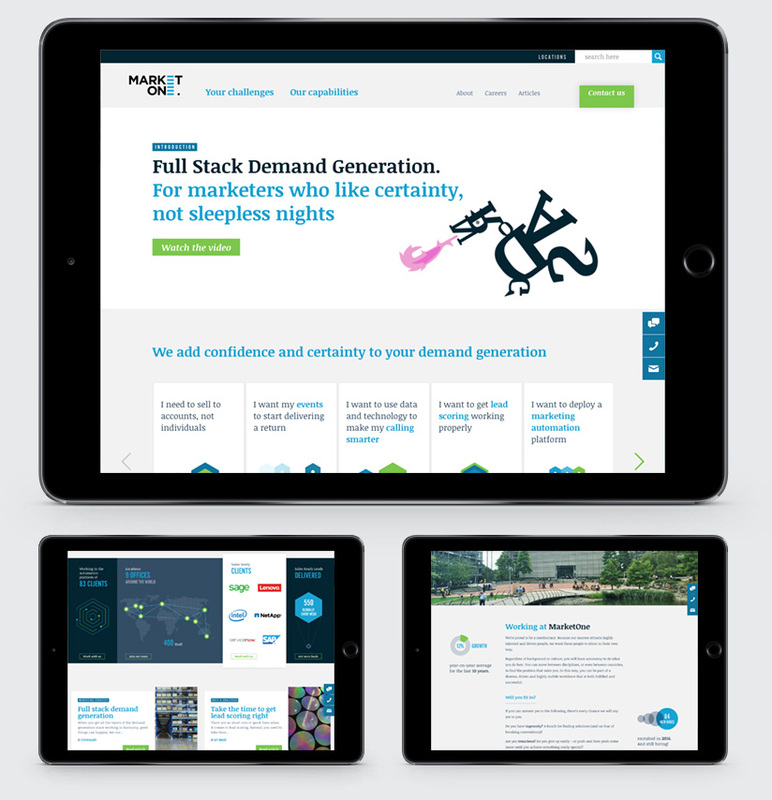 Global experts in Eloqua, Marketo and all things demand generation, MarketOne’s Full Stack approach will crank up your demand generation machine to 11. 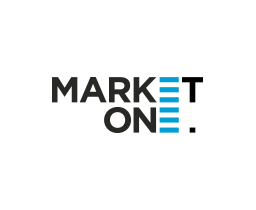 We helped MarketOne with a brand and digital design overhaul. Our brief was to establish a brand that embodied their unique mix: the strategic expertise of a consultancy, the technical ability of an integrator, and the marketing nous of a global agency. A new brand design language and was created to work seamlessly across both print and digital landscapes (we don’t build brands and leave digital as an afterthought round here). This holistic approach allows the brand to live and work beautifully, regardless of the medium, meaning MarketOne maintain consistency of message, brand emphasis and impact at all times. A full design system was created that balanced the key pillars of trust, modernity, data and success. 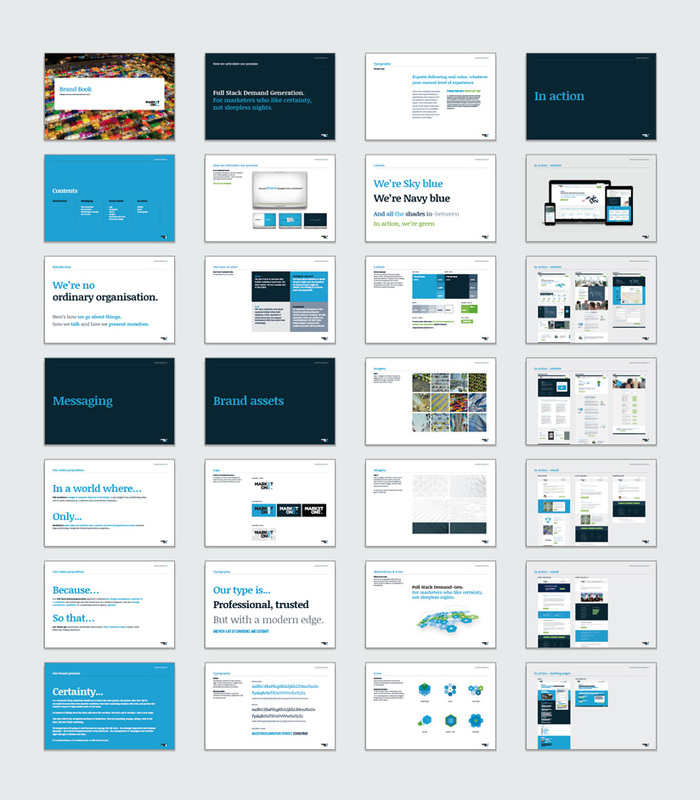 A new website focused on two core user journeys of typical client challenges and key capabilities. 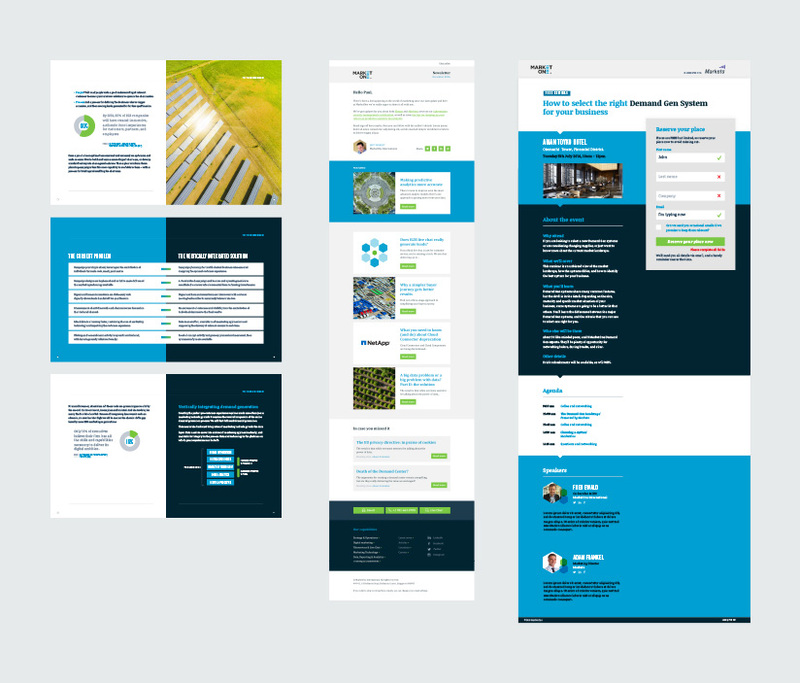 The site is built using a modular approach, giving content managers plenty of flexibility whilst retaining an overall consistent UX design. This approach bakes in the ability to continually enhance and develop the layouts, content and conversion experience in an efficient way. As a result it’s a living, growing, ever-improving site – a model for how all sites should be structured. Effective demand generation requires a detailed mix of planning, technology, content, creative and analysis. This is the Full Stack Demand Generation that is unique to MarketOne. It’s complex process, but very powerful. How do you communicate this in 90 seconds? When you work with MarketOne, what you’re really buying is certainty, so we created a brand video that tells this story in this more emotive, memorable way. Have a look for yourself below. Articles, emails and landing pages completed the digital set, providing a foundation for their own nurturing and comms programs.